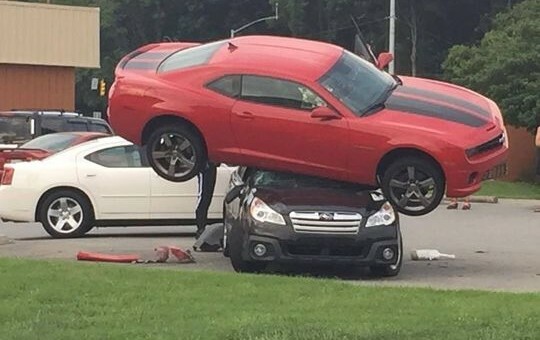 You’re probably looking at this photo of a Chevrolet Camaro on top of a Subaru Outback wondering how that even happens. We sat here wondering the same thing, for at least a solid five straight minutes. Then we found the link to the news report covering the accident. It turns out the 18-year-old driver of the fifth-gen Camaro lost control of the vehicle, which then went airborne, and landed on top of the Subaru. Miraculously, no one was injured at all. The owner of the Subaru was in the store when it happened, and John was able to climb down from his Camaro unscathed. We’d imagine the teen driver had to be traveling pretty quickly in order to get the car up there, but reports say that no citations were given by the police. At least no one was hurt. Next story Community Question: Is The 2016 Chevrolet Colorado Diesel Priced Right? Subaru wishes the BRZ was this close behind the Camaro. Excellent roof strength on that Subie. A Cavalier would’ve been flattened. I am having a hard time believing this, both cars look undamaged. The Camaro nose is mashed up a bit and the Subs right side is damaged. I think the other side looks much worse. THERE MUST HAVE BEEN A CONVENIENTLY PLACED RAMP NEARBY.